The following is inspired by a comment I received in response to this recent piece about gentrification in L.A.
Mary C., who identifies herself as someone working in real estate with “over 30+ years of experience,” argues that these racialized processes of profit and displacement that I describe are not malicious or immoral — just “basic economics.” It’s “natural change,” she insists. In one sense, she’s totally right: it is just basic economics. Low-income communities of color being uprooted as outside investors with lots of money decide that they want to buy property in a certain area is exactly what we would expect to happen in a capitalist market for real estate in which money rules all and shelter has a price tag. But we shouldn’t shrug our shoulders and accept the claim that this is “natural.” Rather, the logical continuation of this above insight should be: if this incredibly unjust and destructive process is simply the normal workings of a capitalist market, we ought to challenge the whole system and ideology of capitalism itself. Capitalism is not natural. It’s unjust. It’s anti-democratic. It puts prices on things that should be provided to all, regardless of income. It perpetuates racial hierarchies while claiming to be race-neutral. It explicitly rejects a society rooted in notions of morality and material equality in favor of one driven by individual greed and the pursuit of profit. Ultimately, it legitimizes the total rule of the rich over the poor. Here, in the case of Mariachi Plaza, it allows a rich white guy from the Westside named Frank “BJ” Turner to single-handedly (backed by the power of the state) kick a bunch of poorer Latinx individuals and families out of their homes in Boyle Heights. 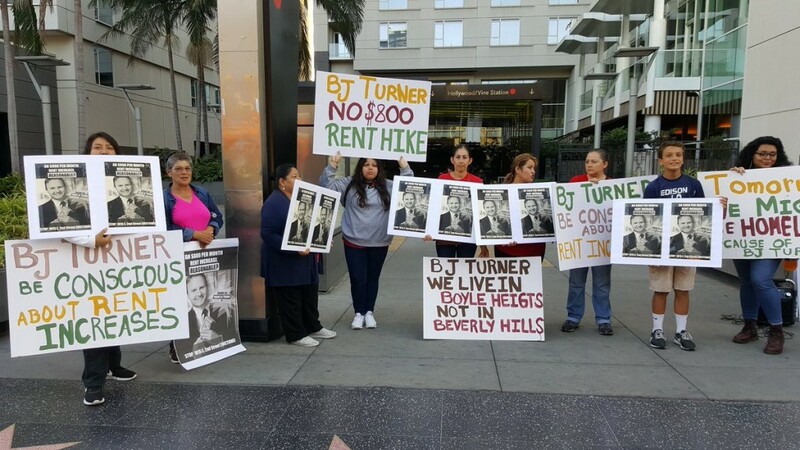 Our dear capitalist, BJ Turner, who will make lots of money from the displacement of 25 low-income Latinx households. Here’s what happened. In Boyle Heights, just east of Downtown L.A., there’s a building near a site called Mariachi Plaza in which several actual mariachis live. In December of 2016, the building was purchased by Turner, with the explicit purpose of raising rents, getting rid of the current tenants, and leasing instead to millennial-creative-class yuppies. The next month, in January of 2017, seven tenants (out of a total of 25 in the building) received notices from the property management company that, at the discretion of the new owner, their rents would go up in April by $500-$800 per month. Gloria Reyes, who has lived there for 27 years, saw her rent increase from $900/mo to $1400/mo. Luis Valdivia, who makes his living as a mariachi, saw his rent increase from $1,020/mo to $1,825/mo. The tenants reached out to Union de Vecinos and joined the Eastside local chapter of the LA Tenants Union. They tried to collectively negotiate a smaller increase with Turner, who they had still never even met, but he refused to bargain. Instead, in June, he filed eviction notices once they failed to pay. The other tenants in the building, sensing that they would be next, organized a rent strike in solidarity. Recently, Turner and his legal team finally agreed to negotiate after hearing about a planned protest at Turner’s West L.A. home. But these negotiations ultimately went nowhere, so now the situation is going back to court. Let’s step back and think about what happened here. We have a building and a community that by all accounts was functioning totally smoothly. None of the tenants had any plans to leave. All of a sudden, a rich white guy who lives on the other side of town, whom nobody in the building has ever met, purchases the literal homes of these 25 poorer individuals and families— a power our system grants him simply because he’s accumulated enough money from past activities to do so (or his parents did, or some combination of the two). Then, because this capitalist will make even more cash once these 25 households abandon their homes and community, he demands a higher rent than they can afford to pay, and thus forces them to leave. If they refuse, the state will enter and take care of their actual removal (a process working its way through the courts as I’m typing this). No community input or democratic control. No conceptions of right and wrong. All that matters is who has the most money. A community is uprooted, and BJ Turner gets his profits. The capitalist system worked. Does that sound natural to you?